What Vegetables Are in Season in Fall? Look for these vegetables at farmers markets and in produce departments in the fall for the best flavor and greatest value. Want more than just vegetables? 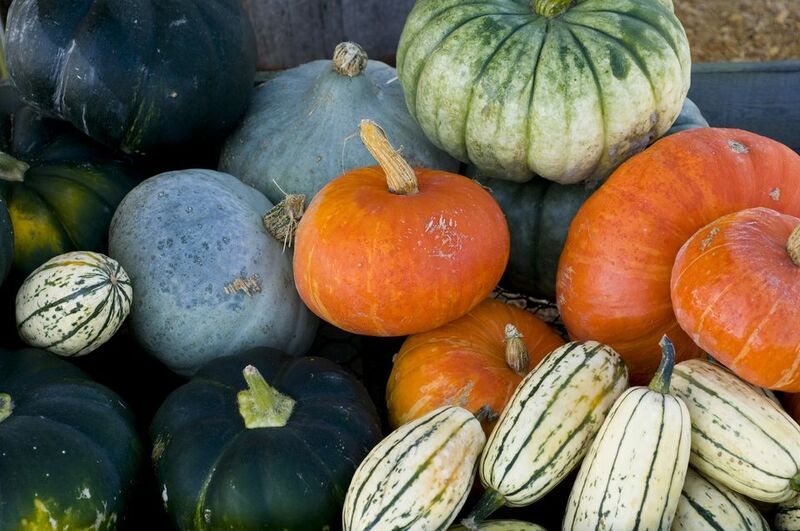 See this complete list of fall produce. Not fall? Check out spring, summer, and winter. Artichokes have a second crop in the fall (the first go-around is in the spring) that produces small to medium artichokes. Arugula is a cool weather peppery green harvested in winter in warm climates, summer in cool ones, and grows in many places during autumn. Beets are in season in temperate climates fall through spring, and available from storage most of the year everywhere else. Belgian Endive has a traditional season (when grown in fields and covered with sand to keep out the light), like that of all chicories, in late fall and winter. Broccoli is more sweet, less bitter and sharp when harvested in the cooler temperatures of fall in most climates. Broccoli Rabe/Rapini is a more bitter, leafier vegetable than its cousin, broccoli, but likes similar cool growing conditions. Cabbage is bright and crisp when raw and mellows and sweetens the longer it's cooked. The cooler the weather when it's harvested, the sweeter it tends to taste (this effect is called "frost kissed"). Carrots are harvested year-round in temperate areas. Unusual varieties are harvested during the carrot's natural season, which is late summer and fall. Cauliflower may be harvested year-round, but it is by nature a cool weather crop at its best from fall into early spring. Celeriac/Celery Root is at its best in the cooler months of fall, winter, and early spring (except in cold climates, where you'll find it during the summer and early fall). Celery is at its best in the fall, with its harvest continuing through winter in warm and temperate climates. Chard like all cooking greens, chard turns bitter when it gets too hot. Chard grows year-round in temperate areas, is best harvested in late summer or early fall in colder areas, and fall through spring in warmer regions. Chicories such as escarole, curly endive, radicchio, and Belgian endives are all at their best in fall and early winter. Chiles are best at the end of summer and into fall. Edamame are fresh soy beans - look for them in late summer and fall. Eggplant comes into season towards the end of summer, but bright shiny heavy-feeling specimens stay in season well into fall. Fennel has a natural season is from fall through early spring. Like most cool weather crops, the plant bolts and turns bitter in warmer weather. Herbs of hearty sorts are available fresh in fall - look for bundles of rosemary, parsley, thyme, and sage. Horseradish is at its best in fall and winter, but stores well and is often available in decent shape well into spring. Jerusalem Artichokes/Sunchokes are brown nubs, that look a bit like small pieces of fresh ginger. Look for firm tubers with smooth, tan skins in fall and winter. Kohlrabi comes into season by the end of fall but stays at its sweet best into winter. Leeks more than about 1 1/2 inches wide tend to have tough inner cores. The top green leaves should look fresh - avoid leeks with wilted tops. Lemongrass grows in warm and tropical areas and is usually available fresh in the U.S. towards mid-fall. Lettuce is in season somewhere in the U.S. year-round. It can also be grown in low-energy greenhouses in colder climates through the winter. Okra needs heat to grow. Look for firm, plump pods in late summer and early fall. Parsnips look like white carrots and have a great nutty flavor. Look for thinner parsnips, since fatter ones tend to have a thick, woody core you need to cut out. Peppers both sweet and spicy are harvested in late summer and early fall. Potatoes are excellent storage vegetables, but most varieties are harvested in the fall. Radicchio, like all chicories, radicchio is sweeter and less bitter when the weather is cool. Radishes (all types) are so fast-growing that they can be sown several times during the growing season in most climates. Fall marks the end of the season for small red radishes and the beginning of the season for larger daikon-type radishes. Rutabagas (also known as "yellow turnips" and "Swedes") are a sweet, nutty root vegetables perfect in stews, roasted, or mashed with plenty of butter. Shallots are harvested in late summer and into fall and are at their sweetest when fresh. Spinach, indeed, has a season. It varies with your climate - year-round in temperate areas, summer and fall in cooler areas, fall through spring in warmers regions. Sweet Potatoes are often sold as "yams." They store well and are available from local sources year-round in warmer areas; from late summer through winter other places. Wild Mushrooms have different seasons throughout the U.S. Most wild mushrooms other than morels are in season in summer through fall.